What Will Be Your First Step Into the Hydrogen Economy? Nuvera is known for many first steps in the development of hydrogen enabling technologies. One of those firsts was the installation of the first hydrogen refueling station in Massachusetts (as reported in 2008 autoblog.com article). Since 2008, the Nuvera® hydrogen station has served for various refueling demonstrations of hydrogen fuel cell vehicles from across the United States. 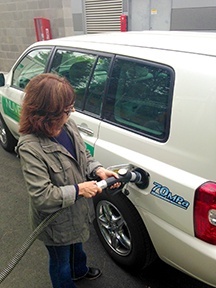 Today, it continues to fuel Toyota’s FCHV-adv fuel cell Highlanders at the Billerica facility. More importantly, the hydrogen station is that significant first step on which adoption is built. The January 15, 2015 Boston Globe Media reference of Nuvera’s hydrogen station in Billerica is an example of that.